A little stone can make a big impact, and at this time of year – diamonds truly are a girl’s best friend. Whether you’re looking for something sparkly for yourself this yuletide, or you simply want to spoil someone you love with truly exquisite jewellery, do it with diamonds! Read on to discover a carefully curated selection of our favourite diamond-encrusted designs to bring some Christmas sparkle at this festive time of year. 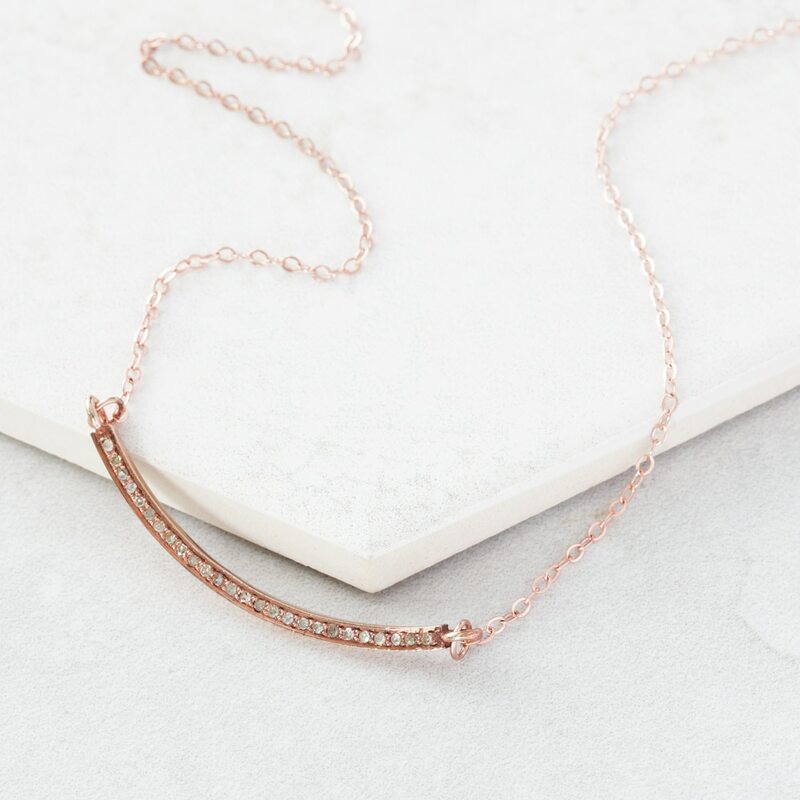 A perfect Christmas gift for someone you love – or even to treat yourself (it’s Christmas, after all) this gorgeous bar necklace is available is chic oxidised silver or beautiful rose gold. The bar is set with real pave diamonds, which are set flat and run along the length of the curved bar, adding a touch of elegant glamour to an already stunning piece. 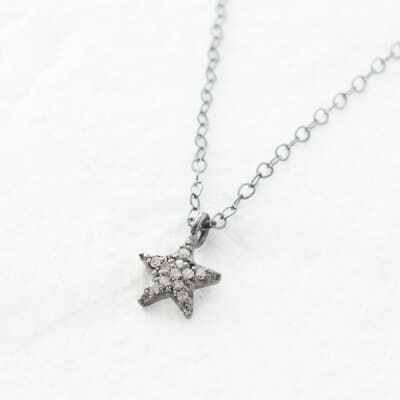 This stylish star pendant is a perfect Christmas gift, conjuring images of celestial bodies in the the sparkling night sky. 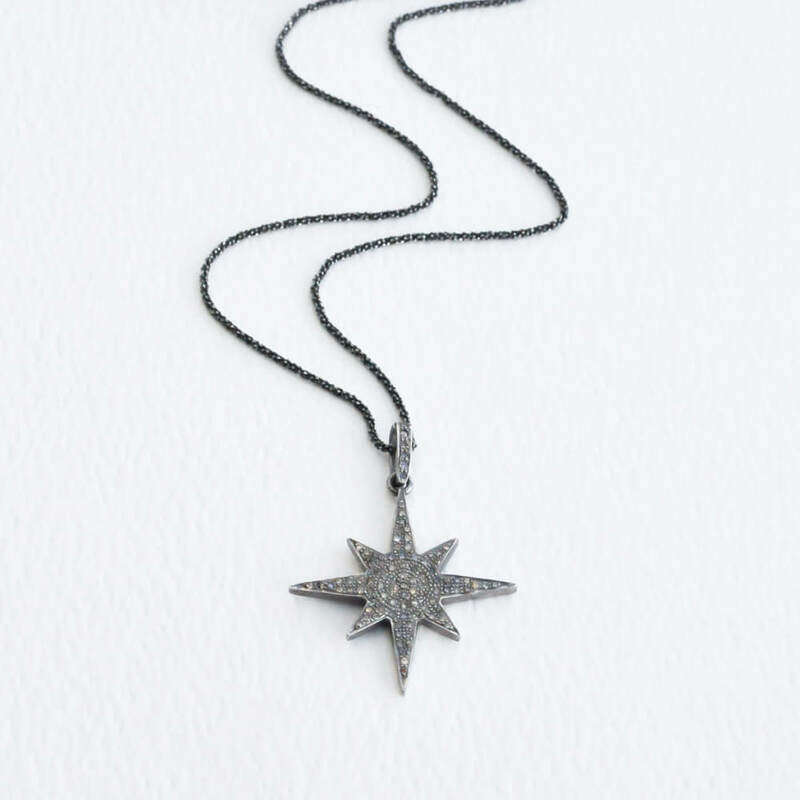 The star design is beautifully symmetrical, having four long points and four shorter points, and is presented on a sparkly oxidised silver necklace for a truly show-stopping effect. This necklace is guaranteed to delight and to impress, as the pendant is encrusted with glittering diamonds, so it shines just like a star in the sky. 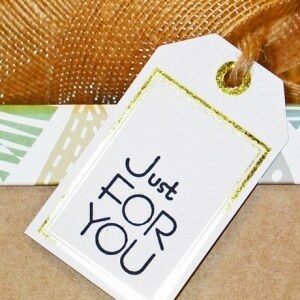 A wonderfully indulgent gift for someone truly special. Perfect as we head into the festive season, you’ll be ready to impress with this diamond pave bracelet – whether you wear it yourself to the office Christmas party, or delight someone with it as a luxury gift. A stunning piece, it sparkles as the light reflects off 0.67ct of Champagne diamonds, set into a stunning oxidised silver heart. 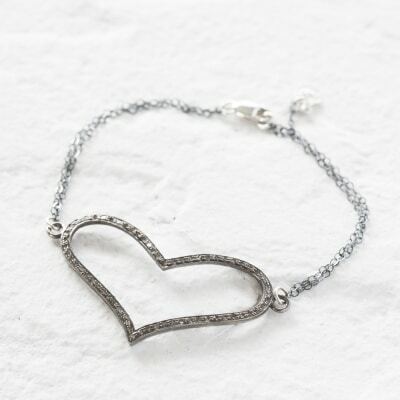 Perfect as a standalone piece, or when paired with the matching necklace for a truly striking effect. The perfect symbol to bestow upon someone at this time of year – wishing them luck and good fortune with a silver wishbone. 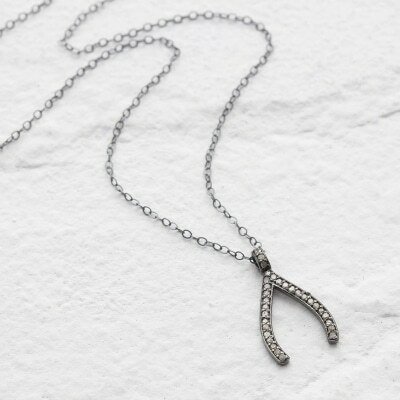 This stunning necklace is a gorgeous contemporary piece with a vintage feel, featuring a beautiful wishbone pendant crafted from oxidised sterling silver and set with pave diamonds on an oxidised silver trace chain. 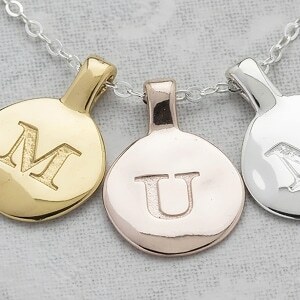 Ideal to wear as a standalone piece, or to layer with other necklaces. Crafted to shimmer just like a real star, this gorgeous pendant is set with pave diamond chips that really catch the light. This beautiful little pendant sits on an antiqued silver chain, melding contemporary design with a vintage feel for a result that is truly magical. This necklace is perfect for layering, or as a standalone piece – and is certain to put a smile on someone’s this Christmas. Cute and compact, but still full of impact this gorgeous pave diamond and gold necklace is perfect for adding some Christmas sparkle to any outfit, and would make a wonderful gift. 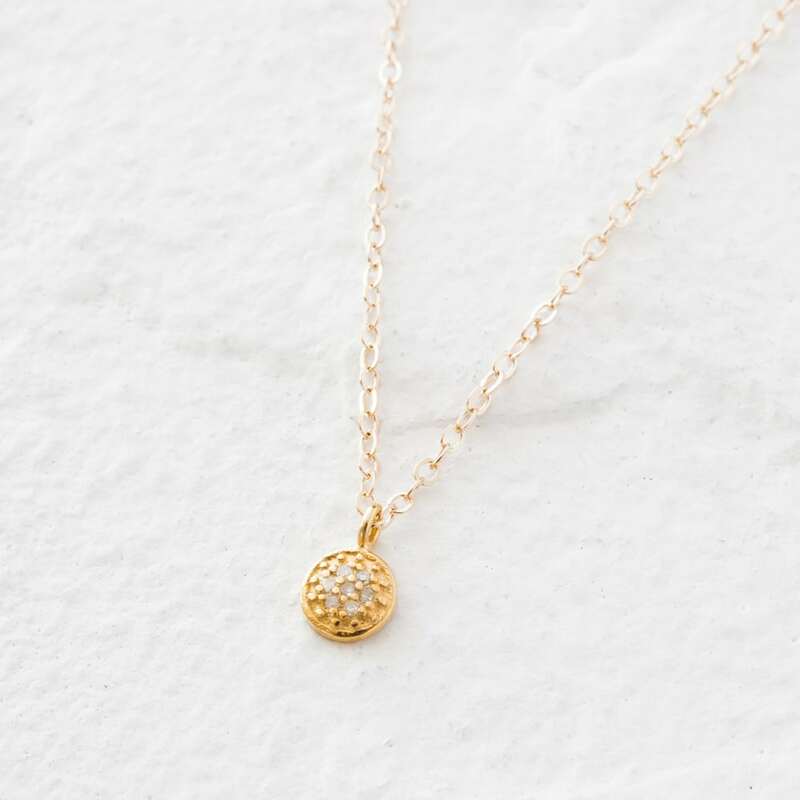 The tiny pave diamond stones set into this little sphere shaped pendant give off a festive shimmer, while the fine gold chain makes it a special and sophisticated piece of jewellery, and a truly stunning gift.